It's that time of year again, when people start thinking about shopping for the holiday season. I'm famous for having all my shopping completed early, and this year is no exception to that. In the spirit of Christmas, I'm working with a number of companies who have joined in my Holiday Gift Guide 2016... and this is the first post! I can't believe how quickly time flies by... my little monkey Brianna is going on 16 months, and she's growing like a weed. 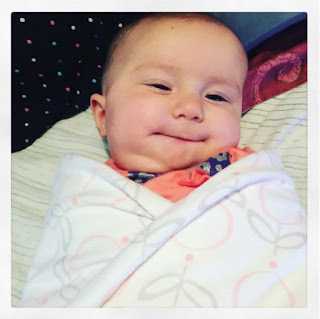 I no longer swaddle her, but that doesn't mean that we don't LOVE all her gorgeous blankets from SwaddleDesigns, that we've been fortunate to review in the past. 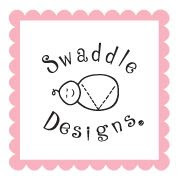 I have a nice collection of swaddle blankets from the company, and they're used on a daily basis. There's one that I always toss in the diaper bag, and there's one that is always in her crib. There's even one at grandma's home, because you never know when you may need one. They make for the perfect baby shower gift, and you can never have too many... it's always good to have a few as a backup... you never know when your little one might spitup or have a diaper accident. To the left is a photo that I took last year of my daughter being swaddled in one of the Ultimate Swaddle blankets. Wow, I can't believe how much she has grown since this photo was taken. Even though I don't really swaddle anymore, it doesn't mean that I don't use the blankets... far from that. This blanket is light weight, but at the same time can be warm when needed since it's flannel. It easily fits in my diaper bag, and barely takes up any room. Even though we're in the summer months, this blanket gets used when we're out, as most places are air conditioned. The company was founded in 2002 by Lynette Damir, RN, CEO and Creative Director. 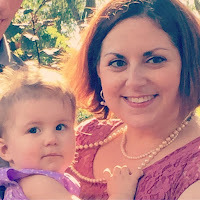 The idea for the company first came about, when she visited families with new babies in their homes, and noticed that they struggled trying to swaddle their babies. She noticed that most of them were using a blanket that was too small or thick, and they forgot how to make a secure swaddle. Parents kept asking her to share the secret of the hospital nurses... how to swaddle. As usual, the wonderful company left a nice little letter at the top when I opened the box. A big special thanks to Lace for going above and beyond... thanks Hun. So once I looked under the letter, the whole package was sealed in tissue paper. Not only was the presentation excellent, but everything was packaged perfectly for the crazy journey through the postal systems. The wonderful company has a newer product out, and once again my family is super excited to test it out. We were sent the Cotton Knit zzZip Me Sack in the Tiny Fox + Star design pattern, and it's super cute. Originally when the company approached me regarding reviewing a sack, I thought, my daughter would be too big. What I love about theirs, is that they come in three sizes... so Brianna fits into the "Large" size, which fits estimating 12 - 18 months aged toddlers. These are perfect for the transitioning between using a swaddler, and a regular blanket... which makes sleeptime safer. What I LOVE about this product... It has a double sided zipper: it zips down from the top to help put baby inside, and it zips up from the bottom to help save time for diaper changes. 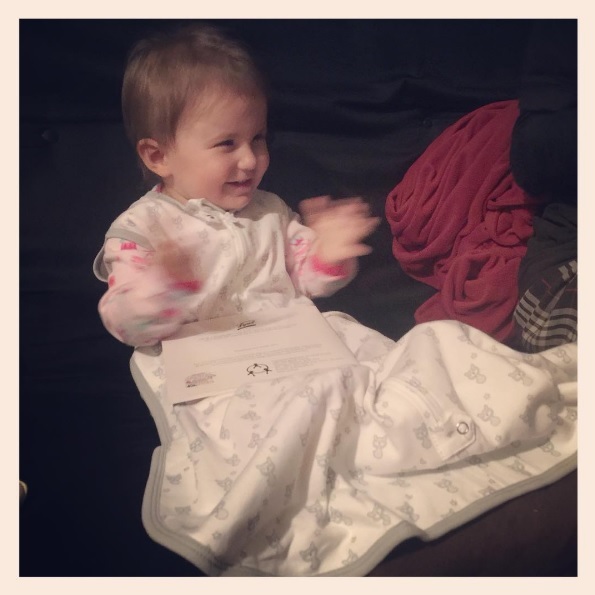 She's clapping because she likes her new zzZipMe Sack! 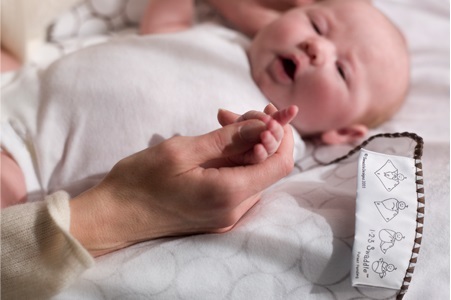 Thanks to SwaddleDesigns one lucky reader has a chance to win a zzZip Me Sack. To qualify you must be 18+, and be a resident of US/CA. a Rafflecopter giveaway I received an item(s), in exchange for my honest opinion, and a review of my experience. I did not receive any other compensation or incentive nor was I required to write a positive review. Individual results or experiences may vary.